Home Arts & Entertainment Musical Theatre Arts / Once upon a… well, a mattress! Arts / Once upon a… well, a mattress! 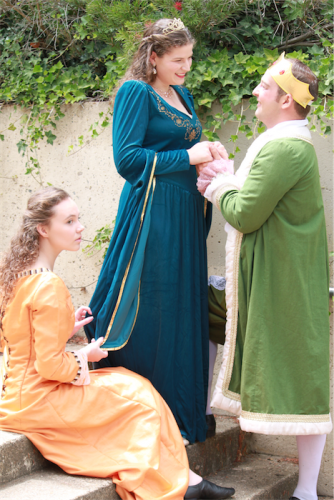 “Once Upon a Mattress”… from left, April Hand as a handmaiden, Alex McPherson as Winnifred and Isaac Gordon as Dauntless. HANS Christian Andersen’s “The Princess and the Pea” is one of his most-loved yet shortest stories, only 379 words in length. We never know the characters’ names, only that the prince is suspicious of most princesses because “there was always something about them that was not as it should be” and that his mother, the queen, sets a test for the bedraggled princess who appears at the gate. Hardly the subject, you’d think, for a musical, but that’s exactly what the story became in 1959 when “Once Upon a Mattress” opened on Broadway in 1959 with music by Mary Rodgers, the daughter of Richard Rodgers, of Rodgers and Hammerstein and lyrics by Marshall Barer. Fleshed out with eccentric characters, it introduces Prince Dauntless the Drab, Queen Aggravain, King Sextimus and Princess Winnifred the Woebegone – the names say it all. In the rather adult subplot, the characters Sir Harry and his pregnant love interest Lady Larken help expand the story. It was unexpectedly successful and has seen several revivals on TV, where comedienne Carol Burnett first played the princess and later the queen, and one on Broadway starring Sarah Jessica Parker. This writer saw Queanbeyan Players stage the show more than 20 years ago and now Ickle Pickle Productions is reviving it here during the school holidays in a production they say is suitable for the whole family. “CityNews” caught up with director Anita Davenport as the cast prepared to head for Harvey Norman in Fyshwick to test the mattresses – in Andersen’s story there are 20 of them. She had heard about the Queanbeyan Players’ version. “People told me they loved it then, so why not now?” she asks. Devonport is no stranger to shows touched by eccentricity, having directed the musical “Barnum” for Canberra Philharmonic during 2018. She praises the array of comic characters in the musical and the vocal opportunities. The prince, played by Isaac Gordon, (also in “Barnum”) Davenport concedes, is a bit of a drip. “We’ve taken care to look at his character and asked why she wants him… But Isaac and Alex [Alex McPherson as Princess Winnifred] in the two leads are wonderful vibrant performers,” she says. The role of Winnifred intrigues her. “She’s a very strong woman, much like his mother Queen Aggravain [Deanna Gibbs] but she does believe in him, and they actually like each other. That’s one of the many instances that makes “Once Upon a Mattress” seem like quite a modern musical, way ahead of its time for 1959. The music ranges from classical styles through to oompapa, she says. Well-known Canberra voice coach, Lauren Nihill, is musical director and as well as the fun tunes there are some lovely love songs, including “In a Little While”, between Steven Galinec and Alissa Pearson playing Sir Harry and Lady Larken. “I love working for Ickle Pickle Productions because it has both adults and young people… some of the cast have done dozens of shows, but you see them talking to the young ones and the newbies – I think that comes through,” says Davenport. “Once Upon a Mattress”, Belconnen Theatre, January 11-24. 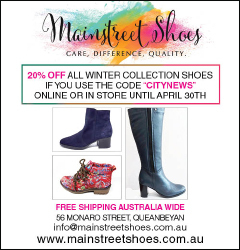 Book at canberraticketing.com.au or 6275 2700.